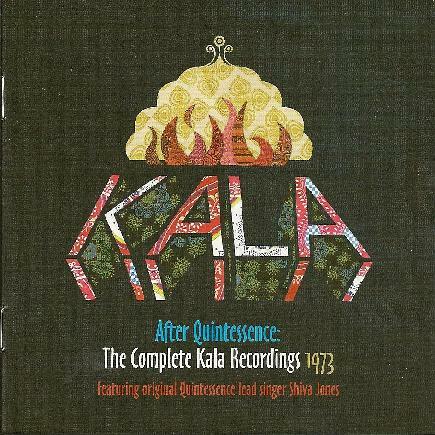 Kala - "After Quintessence: The Complete Kala Recordings 1973"
A year after releasing two documents of Quintessence live performances from 1970 and 1971 (CLICK HERE to read my review), Hux Records continues to complete Quintessence history by reissuing on CD the 1973 self-titled album by Kala. After being fired from Quintessence in mid-1972, singer Phil "Shiva" Jones and rhythm guitarist Dave "Maha Dev" Coddling formed Kala, a band that lasted barely a year and released one album and one single. Jones explains in the liner notes that his goal with Kala was to get away from the improvisation that characterized Quintessence and focus more on structured songs with controlled solos, and this is evident throughout the album. Songs like Travelling Home and Still Got Time blend Country and Blues, the former being a well crafted pop song with soulful backing vocals and excellent guitar. Still Got Time is similar and includes an outstanding instrumental section at the end, which segues seamlessly into the next track, Hallelujah, a gorgeously soulful song that makes for a killer coda to Still Got Time. Sun and Pearl have a spiritual feel that recalls Quintessence, especially on Pearl, a standout track that throws some excellent country guitar into the mix. My personal favorites are Thirsty Generation, Meditations, and Honey Of Love, all of which are among the most musically adventurous tracks on the album. Thirsty Generation is an accessible song with a progressive rock edge and brief forays into psychedelia. At 7+ minutes Meditations is the longest track on the album. It begins with a spiritual Quintessence vibe, but then goes into a quiet instrumental interlude that culminates in a fiery rocking, almost Santana-like jam. And Honey Of Love features more Country-Blues, with a dual guitar interplay that at times recalls the Allman Brothers. The song transitions through multiple themes, with backing vocals that beautifully augment Shiva's singing. Add yet another rocking jam and you have a fine finale to the original studio album. For a band that only lasted a year, Kala's history was turbulent, with multiple personnel shakeups and strife with their record company that far too many musicians have regrettably experienced. The reissue includes four live bonus tracks with two different lineups of the band. One aspect of Kala that it shared in common with Quintessence was a live experience that was in marked contrast to the studio album. Two of the tracks are from a 1973 performance that consisted of a quartet of musicians from the album, minus Dave, who had been fired. There's a nice live version of Honey Of Love. But the surprise is Going Down Slow, which is pure BLUES, with killer guitar from Les Nicol and further evidence of Jones' varied vocal talents. But the real stunners are the two tracks from Bradley's Roadshow, a live album compilation of artists on the Bradley label. After being threatened by the band over money, a fortuitous run in with Jones' old friend Chris Brown, from their 1960s Australian band Phil Jones and the Unknown Blues, led to a completely new lineup of Kala. The first track is Come On Around To My House which is…. Wow, this ain't nuthin' like anything on the album. This is firebrand Blues infused progressive hard rock, with down 'n dirty vocal intensity from Jones that I can only imagine would leave Quintessence fans heads spinning. And Before You Leave is a good time bluesy soulful dance floor packing rocker. At nearly 10 minutes the band stretch out plenty, and Jones' vocals inject a classic James Brown revue vibe into the performance. Go Phil! What an amazingly tight band. I'd love to hear a full set from this lineup of Kala. The reissue is rounded out by two songs from the album - Meditations and Still Got Time - with new vocals recorded in 2010 by Jones. And like last years Quintessence live sets, the CD comes with a 16 page booklet, packed with interviews with Phil and Dave, pictures, album details and more. I can't lavish enough praise on Hux Records for all the history and insight that comes with this package.